Mayor Ed Murray has announced Seattle will implement a low-cost, phased-in approach to make it easier for musicians to load and unload their equipment at local music venues. So far, the Seattle Department of Transportation (SDOT) and the Office of Film and Music (OFM) have worked with four local music venues to install the signs. They include High Dive, The Crocodile, The Triple Door and Showbox at the Market. 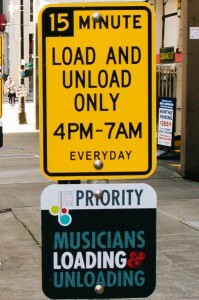 The City of Seattle invites other interested music venues to request similar load zones. But in order to qualify for the Musician Load Zone program, businesses must meet the requirements defined in the Admissions Tax Exemption for Live Music Venues. If they do, the city will evaluate whether a load zone is feasible. Businesses should contact Rachel White, OFM’s Music and Creative Industries Program Manager at rachel.white@seattle.gov or (206) 684-8504. For the music community, the new program should come as positive news after the mayor’s recent sacking of James Keblas, the popular head of the city’s Office of Film + Music.